● 5 and 1 users registration require that this program to have access to internet HTTP and FTP ports for activation. ● German version of the program, including the help file. ● French version of the program, including the help file. ● On DBFNTX driver, if an index exist with the same name as the DBF, it is opened automatically. ● For foreign languages using the (",") comma as decimal separator and when OEM indices (CLIPPER) are used. to be fully compatible with clipper convention. ● FoxPro DBFCDX, Clipper DBFNTX, Dbase IV DBFMDX, and CDXDBV, NTXDBV, MDXDBV for FlexFile 3 users. ● You have an auto RDD detection option. ● Safe copy of a database. To repair damaged memo or object fields. ● Creation and printing of a calculated field from numeric fields. and cumulative Count/Total on each pages. and .html file and your internet browser will be automatically called. and .pdf file and your acrobat reader will be automatically called. ● The program keeps the Page Size, Page Orientation and the Margins of your last printing job. ● Full Multiple Tabs Windows view, therefore each DBF as his own tab. ● You can toggle view from Browse view to Form view on the fly with the F2 key. ● You can toggle view from Full Multiple Tabs to Standard View Window on the fly with the F3 key. are sorted from last open file to the oldest open file. ● There is a drop down toolbar menu to quickly set a filter on deleted and none deleted records. ● Edition of database object fields. ● RTF File Editor for external files and memo fields. ● Array Editor ( for DBFCDX , NTXDBV , CDXDBV, MDXDBV memo driver). ● Renaming of fieldname or Field Type on the fly. ● Marking of multiple records that can be deleted / recall / lock / unlock / create database from the marked records. ● Copy/Paste field ,including object field, field from within database or other opened databases. ( If Field Type match ). ● Filter the marked records on the Filter dialog. ● Internal explorer style ini file editor. ● Switching from share to exclusive mode and vice versa without closing and reopening the DBF. It is done in background. ● Marking of DUPLICATE records, when an index is "ON". items can be exported to files. open *and* we can edit the database. They always stay on top. ● Very fast text search of a database. The result gives the record number and highlight the field. ● Find Dialog that can search a string through all databases fields with the AllInstr() function. ● Changing Date/Time/Attributes of any single or multiple files. ● Deleted and marked rows in the browse views can be highlighted to the color of your choice from the option dialog. ● Generation of array code from a DBF. Very useful when you want to fill a combo box at compile time. default driver and the exclusive mode settings. and the exclusive mode settings. to 4 digits year. This is done automatically either in OEM or ANSI databases. ● Create a Test Database, including Memo and Object fields, with random data. ● DBCalc function that gives count, min, max, avg and sum of numeric fields. ● DBTotal function that gives the numeric total of numeric fields. ● On DBTotal function, you can choose display fields . Copyright © 1996-2017 by Jean Raymond (Rayonline.com). All rights reserved. Disclaimers: The author gives no warranty as to the contents of this document or the software contained herein, and specifically disclaims any warranties of merchantability or fitness for any particular purpose. The author will not be liable for indirect, special, consequential or other damages resulting from the use of this product. The author reserves the right to make changes to the specifications of this software product and contents of its documentation electronically or printed without obligation to notify any person or organization of such changes. Distribution: This program executable, help file, DLL and related text files may be distributed freely and may be used without fee by any individual. However you agree to pay the registration fee if you want to get rid of the register warning window. A registration file or an activation code will be sent to you to unlock that feature.This version of cmVodbx32 may not be distributed as a part of any commercial package. Unlimited License ( Portable application ) must be used for internal company use only. -All company computers including lap tops-Home computers as long as you still working for the company-Customers sites computers for the duration of the work. Is an ID from Current Computer Name, Current User Name and Network Station Name.Any changes from the above definition will require a new registration. This shareware program is a database manager for ".DBF" file format. It has 30 days limit of free trial. It is written in CA Visual Object 2.8 SP3 and ClassMate 2.09 code and is intended to be the Fastest Window .DBF database manager on the market. Source Code for cmVodbx32 is now available (See the Purchase page). 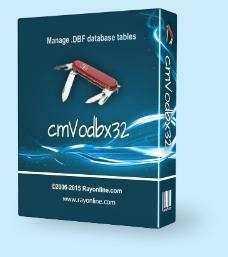 German language DLL, help file and language source code for cmVodbx32 (See Download page). Many thanks to Boris Cornet bgc@surfeu.at for German translation. French language DLL, help file and language source code for cmVodbx32 (See Download page).